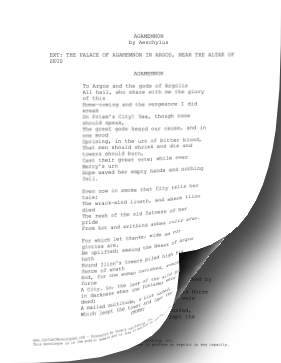 Agamemnon gives a victorious 4-5 minute speech in this audition monologue from Aeschylus' classic play, Agamemnon. Hope waved her empty hands and nothing fell. From hot and writhing ashes rolls afar. Which leapt the tower and lapt the blood of Kings! Lo, to the Gods I make these thanksgivings. And feels another's gladness like a curse. Which guides me here, which saved me far away. O Victory, now mine own, be mine alway!